We recently published an article that describes our new work on a more generalized plasma architecture. This post goes into more detail about the architecture for those who are interested in how things work under the hood. We’ll go over how everything fits together at a high level, then we’ll jump into the sample implementation in Python. You can scroll forward to the diagrams if you’re already very familiar with plasma. 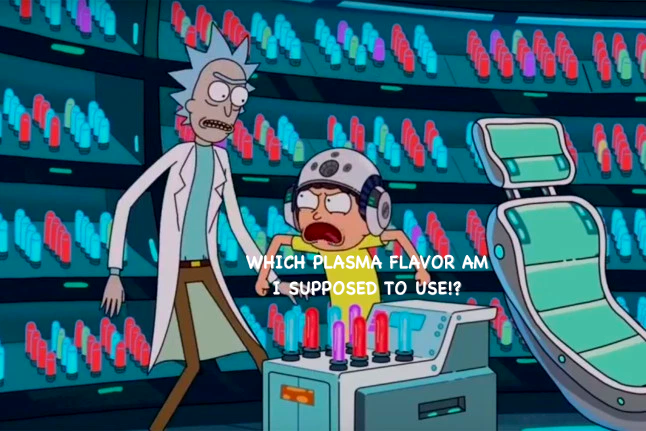 It’s hard to keep up with plasma research: those who are familiar with plasma have likely heard of all the different plasma flavors. Each flavor has a different sent of tradeoffs, and keeping up with rapidly evolving research is a full time job. Most developers just want simple and easy ways to scale their dapps. People want good tools and well documented libraries. They certainly don’t want to build entire blockchains from scratch to run a single app. So we set out to create a platform that makes it easy to build scalable blockchain applications without having to be a plasma expert. We ended up with a general purpose plasma chain you can build apps (or “plapps”) on. Sound weird yet? Plapp. Plaaapp. Plappp. Yup. Rick and Morty having trouble keeping up with plasma research. The core idea behind “Layer 2” is that we can use data outside of a main blockchain (“off-chain data”) to provide guarantees about assets sitting on the main blockchain (“on-chain data”). For example, that off-chain data might give you the right to withdraw an asset held in an on-chain escrow contract on Ethereum. But the ownership of that asset changed hands without touching Ethereum. But what happens if after submitting the claim, the person making the aforementioned claim also sings a message sending asset X to someone else? This would invalidate the above withdrawal. To ensure that any such invalid withdrawals are unsuccessful, we add a dispute period to every claim. Anyone may challenge the claim before the end of the dispute period. Otherwise, the claim is considered valid. Simple enough! Let’s quickly relate this back to plasma. Plasma chains consist of a series of blocks, and each block consists of a series of transactions. Whenever a new plasma chain block is created, a cryptographic commitment to that block is published to the main chain. These commitments can be used to prove that something was inside that block. In our case, this commitment is a merkle root created from all state updates in the block. The plasma smart contract on Ethereum records the order in which plasma blocks are committed by the operator, and prevents commitments from ever being overwritten. Thus, these block commitments give us a sense of time. When users want to make claims about something that happened on plasma chain, they have to also reference when that thing happened through the block number. For example, a user might say, “Here’s transaction X in block Y that gave me asset Z.” This extra time dimension is also important for disputes because you sometimes want to know whether something happened before or after something else! So as we’ve just seen, Layer 2 is primarily about using some off-chain data to affect things sitting on-chain. So far, off-chain data has mostly been used to represent ownership — who owns what, and whether it changed hands. Alice will deposit an asset into a smart contract on Ethereum and she will become the owner of that asset. She can then sign an off-chain message that transfers ownership of the asset to Bob. Bob can then withdraw the asset back on Ethereum by making a claim using that signed message. We can also represent more complex things than ownership. Let’s say Alice deposits a CryptoKitty and signs a bunch of messages that change the kitty’s fur color. Just like in the example above, she can eventually make a claim on Ethereum about the kitty’s fur color using the last message she signed! Whether it’s changing the kitty’s fur color or eye color, the smart contract back on Ethereum needs to have a way of understanding these changes. Each new piece of functionality — or new type of “state transition” — requires a change to the logic followed by the plasma contract. In previous plasma specs, adding a feature like this meant that one would have to re-deploy the *entire* plasma contract and migrate everyone’s assets from the old plasma chain to the new one. This is not secure, scalable, or upgradeable. We ran into this upgradeability problem once we got far enough into our plasma chain design that we wanted to add new functionality. After some brainstorming, we realized there was an easy way to add new functionality without changing the main plasma chain contract. All of the various scenarios we’ve talked about so far have something in common — the off chain data is always for the purpose of “disputing” incorrect on-chain claims. The dispute for a particular claim is basically just some proof that the state referenced in the claim is outdated. A dispute about ownership proves that the user making the claim later transferred ownership to someone else. A dispute about kitty fur color requires proving that the kitty’s fur color has been changed. Our primary breakthrough was realizing that dispute conditions don’t need to be checked in the main smart contract. Instead, we could have other smart contracts implement a function that would tell us if the dispute was valid or not. We could add new functionality by creating a new contract that implemented the necessary logic for that functionality and then have our main contract reference the new one. We call these external contracts ‘predicates’. Now it was really easy to add new functionality, but we still needed a way to know which predicate to use for a particular state update. A claim about a kitty’s fur color can’t be disputed by a change in the kitty’s eye color. So how do we know which predicate to use? Since users can specify any predicate address they want, anyone can add new functionality to the plasma chain at any time by deploying a new predicate on Ethereum. There’s a little more to predicates than just handling disputes, but we’ll get into that later. What’s important is that predicates just have to implement a standard interface, defined in this next section. predicateAddress: The on-chain address that controls the object. parameters: Some arbitrary blob of data that describes the object. Structure of a plasma state object. State objects are effectively assets — a generalization of the concept of the non-fungible “coins” in Plasma Cash. Just like each unique coin had a coinID in Cash, each state object has a stateID . That’s it! The stateIDs are assigned sequentially based on deposits into the plasma chain, but there aren’t any rules about what parameters or predicate can be. Each plasma block is a collection of “state updates,” which define new stateObjectss at particular stateIDs. The plasma chain contract on Ethereum, where the operator submits plasma blockhashes, implements a verifyUpdate(update: stateUpdate, updateWitness:bytes) -> bool which checks a Merkle inclusion proof (updateWitness) that the state update was indeed committed. Predicates need to implement a standard contract interface. Let’s go over those functions. The most important thing thing the plasma contract does is determine the validity of state updates. Particularly, we need to prevent the operator (who has full control over blocks) from being able to “sneak in” a valid state update which has its stateObject.parameters.owner == operator — this would be theft! To accomplish this, we introduce the concept of “state deprecation.” We say that the valid state for a given stateID is that of the earliest update which has not yet been “deprecated.” State deprecation is analogous to an Unspent Transaction Output becoming a Spent Transaction Output for UTXO blockchains. This way, even if the operator sneaks in a later update where stateObject.parameters.owner == operator, an earlier update with stateObject.parameters.owner == alice will prevail, as only she can deprecate the state. 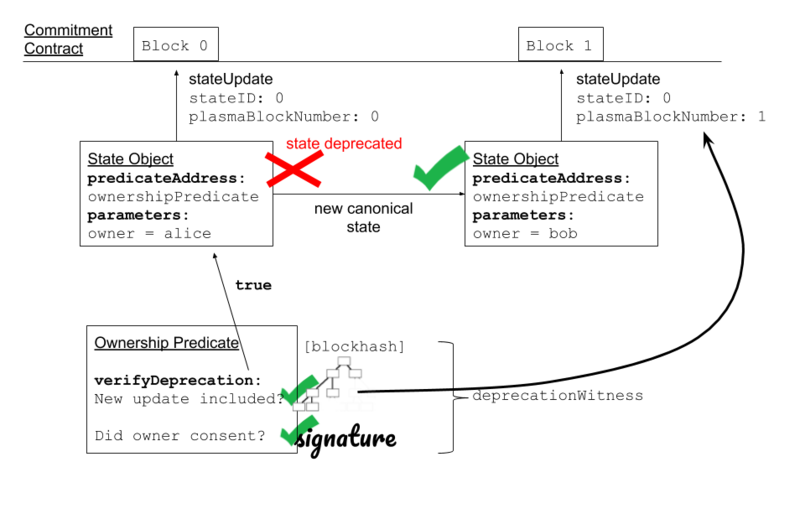 verifyDeprecation returns true or false depending on whether the committed stateUpdate has been deprecated for a particular stateID. deprecationWitness is any arbitrary data that the predicate uses to check whether or not the stateObject has been deprecated. For example, by requiring that the deprecationWitness includes a valid signature from the update.stateObject.parameters.owner, we guarantee only the owner can approve a deprecation. Remember, this function doesn’t actually do any deprecation as it regards to plasma’s exits games, disputes, and so on. Rather, the plasma contract calls the function when it needs to know whether a stateObject is deprecated to evaluate a dispute. When an exit is redeemed, the plasma contract sends any assets associated with the claim to the predicate address and then calls this function. This function allows the predicate to restrict who may initiate a claim on the committed state. For example, an ownership predicate probably wants to restrict canInitiateExit to the owner of the asset. This function allows the predicate to increase the dispute period of a claim. We only really use this for complex predicates (e.g. atomic swaps) that might require a longer dispute resolution process. This function usually just returns 0. Everything is easier with examples, so let’s take a look at one. The simplest predicate is the ownership predicate. This state allows its current parameters.owner to exit at any time, or approve any state update. A signature from state.parameters.owner agreeing to a new stateUpdate. A proof that the new stateUpdate was committed in a later plasma block. verifyDeprecated needs to check that these things are valid, which means checking a signature and a Merkle proof. Conditions for an ownership state to be deprecated. Single Ownership Predicate Flow. Alice sends stateID 0 to Bob, deprecating the update from block 0. The remaining functions are pretty simple. canInitiateExit needs to check that the claimant is the owner, finalizeExit forwards the assets over to the owner, and getAdditionalDisputePeriod can return 0. Here’s what that actually looks like in code! Below we’ve included a Python implementation of the simple ownership predicate. We wrote it in Python for simplicity, but it’s pretty easy to do in Solidity or Vyper as well. As you can see, we’ve implemented the entire interface described above. Not too difficult :-). And there we have it! A predicate that represents transferable ownership of an asset. Most of the logic here is identical to what was already being done in plasma contracts. We even managed to prototype the change over the course of ETHDenver. It was mostly a matter of moving around code that we’d already written. This architecture is a significant step forward in our understanding of plasma. It is analogous to the jump from payment channels to generalized state channels–we are able to fit new features and functionalities in the plasma architecture without upgrading the plasma protocol itself. However, it’s important to remember that predicates are not a panacea–they are still constrained within the plasma design space. More generalization is likely yet to be found. Nevertheless, predicates are very powerful, and seem useful for pretty much all plasma implementations–including those which are not based on Plasma Cash. We think this represents an opportunity for standardization within the entire plasma ecosystem. Any plasma implementation which shares this state-deprecation architecture can share predicates and interoperate in new ways. Layer 2 scaling solutions are all about using off-chain data to guarantee future on-chain state. Whether old state is deprecated through signatures (state channels), commitments (plasma), or something else, these tools are ultimately accomplishing the same thing. We hope that this advancement is a step towards a unified, shared language which encompasses all layer 2 solutions. We envision a future where wallets can connect to any layer 2 solution through utilizing a standard interface, rather than writing custom integration each time. All for interoperability, and interoperability for all!